The war in Yemen is heading towards its fourth year, its only tangible result so far being the gradual destruction of the country and its people. Ostensibly, it is being fought to restore the rule of Yemen’s deposed president, Abd Rabbuh Mansour Hadi, who fled to Saudi Arabia in the wake of the 2014 Houthi takeover of Sanaa. The war is also intended to thwart Iran’s alleged plan to spread its control throughout Yemen using the Houthi rebels as proxies. But the indiscriminate ferocity of the coalition’s onslaught on Yemen cannot be explained by these supposed motives. Why was it necessary to bomb the country back to the stone age and target its civilians, ensuring it will not recover for a century? To answer this question, one must understand Arabian history and Saudi Arabia’s small place in it. In ancient times, Yemen was home to several flourishing civilisations. At least six kingdoms developed here from the 12th century BC onwards, based in Ma’in, Qataban, Hadramaut, Ausan, Saba and Himyar. The most prominent was the Sabaean kingdom, which lasted for 11 centuries and was one of the most important in the Near East. Popular legend identifies it with the Queen of Sheba, and the kingdom of Saba is mentioned in the Quran. Its capital was in Marib, where the Sabaeans built a great dam that was a marvel of ancient engineering. They developed an advanced irrigation system through canal networks and a wealth of farmlands. By 700 BC, the Sabaeans had spread their rule over most of South Arabia. The splendid civilisation they created was based on the spice trade in frankincense and myrrh, which they expanded through trading networks that reached as far as China, India and the Near East. To facilitate their trade, they built a series of colonies up the Red Sea route to the Near East, and were in control of the Bab al-Mandab exit to the Indian Ocean and the Horn of Africa. Remnants of Sabaean art and architecture have been found as far away as northern Ethiopia. With the advent of Islam, Yemeni tribes played a major role in the Arab conquests of Egypt, Iraq, Persia and the Levant. By the 13th century, Yemen had a thriving Islamic culture, along with numerous madrassas and centres of Islamic learning. With this came the development of a distinctive architecture based almost entirely on local building materials, unique in the Arab region. Sanaa’s old city, dating from the first Christian century, is a prime example. What, in contrast to these legendary Yemeni achievements, did North Arabia, most of which makes up modern Saudi Arabia, have to offer that could remotely compare? Until the arrival of Islam in the seventh century, that part of Arabia was traditionally ruled by tribal chiefs, mostly isolated and obscure, and as such could never have rivalled the kingdoms of Yemen. Even after Islam, the splendours of Islamic civilisation were not created in North Arabia, but outside. Despite being a modern construction in its current incarnation, Yemen is steeped in history. Today’s Saudi Arabia is a more thoroughly recent creation, only established in the 1930s, and the United Arab Emirates, its fellow coalition war partner, set up even more recently in 1971. They have little history or secular culture that could hold a candle to the civilisations their bombing war is laying waste to. The Saud family’s Wahhabist-inspired destruction of historical buildings, tombs and monuments in Mecca and Medina set a dangerous precedent for what is happening in Yemen. The war has led to widespread destitution and disease. 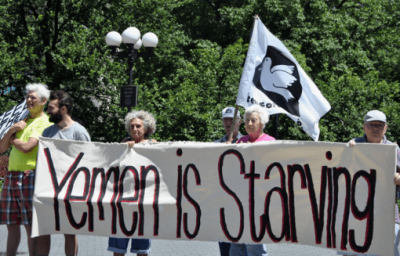 The UN estimates that 14 million people, or half of Yemen’s population, are at risk of starvation. According to UNICEF, 1.8 million children are acutely malnutritioned, 400,000 of whom suffer from severe acute malnutrition. The bombing has killed more than 10,000 people, left 22 million – most of Yemen’s population – in need of international aid, and provoked the largest cholera outbreak ever recorded. Half the country’s medical facilities have been destroyed in a coalition bombing campaign that has targeted civilian infrastructure, and often, civilians themselves. The physical damage to Yemen’s infrastructure – its schools, hospitals and markets – has been severe, but at least they can be rebuilt in a time of peace. The same cannot be said of the irreparable harm done to Yemen’s historic architecture. UNESCO has documented the war’s devastating effects on Sanaa’s Old City, its mosques, bathhouses, and mud-brick houses with their distinctive, arched, gypsum-framed windows. The same has happened to the Old City of Saada, the ancient Marib dam, the historic city of Baraqish, and Hadhramaut’s irreplaceable ancient tombs. These losses are permanent. Surveying this disproportionate degree of death and destruction, one must wonder if the real motive for the Yemen war, just like the Saudis’ visceral hostility towards another great civilisation, Iran, is a deep-seated envy of the grandeur of these countries’ place in human history. If so, bombing Yemen out of existence will not delete its glorious past, nor give Saudi Arabia what it never had. Ghada Karmi is a Palestinian doctor, academic and author.